Contiweb has recently won 3 deals in Italy for Contiweb dryers. Two of them are Ecoset drying systems. In one case it concerns an Ecoweb dryer. In all three cases the dryer is attached to manroland printing presses. Three new Contiweb dryers in Italy. Last June, a new Contiweb Ecoweb dryer was successfully installed at Rotolito. This dryer is attached to Rotolito’s new manroland Lithoman IV 48-page press. In addition, Coptip in Modena has equipped its new manroland Lithoman 80-page press with a Contiweb Ecoset. Finally, Elcograf will place a new manroland Lithoman 72-page press at the Pozzo d’Adda plant. This new press will also be equipped with a new Contiweb Ecoset dryer. The installation will take place soon. Drying is a critical component in heatset web applications. Contiweb continues to set the industry standards for quality, efficiency and reliability through the innovative technology of its dryers. Ecoset, Ecocool, Ecotherm and Ecoweb models complement all press systems, including the widest and fastest 80- and 96-page presses. They also enhance presses and press rebuild projects. 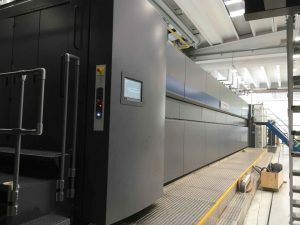 All Contiweb dryers rely on a high-air volume, low-temperature process that optimizes print quality and productivity by minimizing the negative effects of heating the web. They combine high performance with simplified operation and low operational costs. Integrating the chilling function further enhances print quality and reduces floor space requirements. The Ecoset is Contiweb’s latest innovative dryer for web offset presses with the lowest energy consumption in the industry. The dryer exhaust can be reduced to a minimum due to a combination of technologies, such as the direct integration of the chills, extension of the drying sections and better control of cold and hot air flows inside the dryer. As a result, gas consumption is reduced by 70% and also electricity consumption is reduced significantly. Since the introduction in 2008 Contiweb has already installed over 90 Ecoset dryers. More information on Contiweb Dryers can be found here.